Moana Hope has become the first woman to kick 100 goals in a season in the Victorian Women's Football League. GOALKICKING star Moana Hope was honoured with a Maori war dance after completing her century milestone on Sunday afternoon. Brothers and cousins raced on to the ground at Seaford in Melbourne’s outer south-east to embrace Hope after the St Kilda Sharks forward became the first player to kick 100 goals in the Victorian Women's Football League. 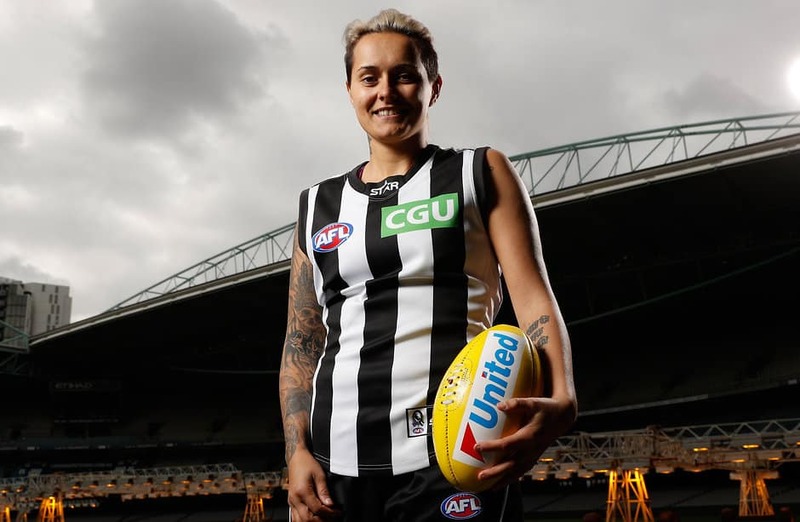 Collingwood's marquee forward, sitting on 99 goals heading into the last home and away round, nervously bungled a set shot in the opening minutes before booting her 100th, at the 12- minute mark of the game against Seaford. Hope marked a quick kick from a pack on the edge of the goalsquare. When Seaford opponent Michelle Goodwin slipped to the turf in the contest, the Sharks ace quickly played on to ram through the goal from close range. Teammates ran from all parts of the ground, including the interchange bench, to engulf her in a backslapping mob. And the family members, who arrived at the game in a minibus, performed the Haka in front of the assembled Sharks players during the five-minute interruption to the match. "It's very traditional for us. We do that for any big family occasion, a funeral, birthday, Christmas," Hope said. "Once I got that mark, it was more the relief that it was done and dusted." Hope admitted she suffered a brief attack of nerves when lining up the earlier set shot after being shaken by a heavy fall while grabbing a chest mark on a lead. "Seeing my family behind the goals and (my teammates) right behind me (gave me) butterflies in my stomach," she said. Hope shrugged off close checking from Goodwin to kick five goals – her season average – in the Sharks' 83-point win. "Now we can focus on the bigger picture, which is the team and the finals. We look forward to that," she said.